Roses have always been a popular garden plant, and with the introduction of easy-to-grow Knockout roses anyone can enjoy blooms all summer. 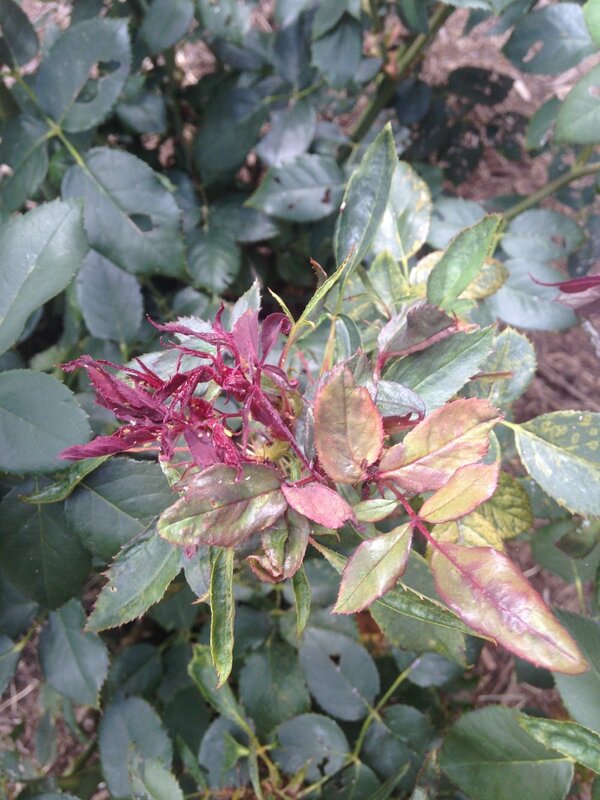 But lately we've been seeing a spike in a disease that will ruin your roses: rose rosette disease (RRD). If you want to keep your roses, the disease must be caught early and cut out aggressively. So we want you to know the warning signs. The first signs that you have a problem with RRD are unusual growth and coloration. In the early stages, the differences will be very subtle. You're looking for rapid growth, especially in just one part of the shrub, with unusually fleshy stems. They will also be reddish, and may have thorns beginning to spiral around the stem instead of being scattered around as they are on healthy branches. In the spring you'll see a lot of rapid growth (often with reddish colors) anyway, so the giveaway here is that the growth will likely be uneven, and the thorn configuration can be off. Another early sign is that flowers are fading quickly, often with dark specks on the petals. Later symptoms are much more dramatic. Leaves start to look twisted and narrower. At first they will likely have yellow flecks, but eventually they become shriveled and red. 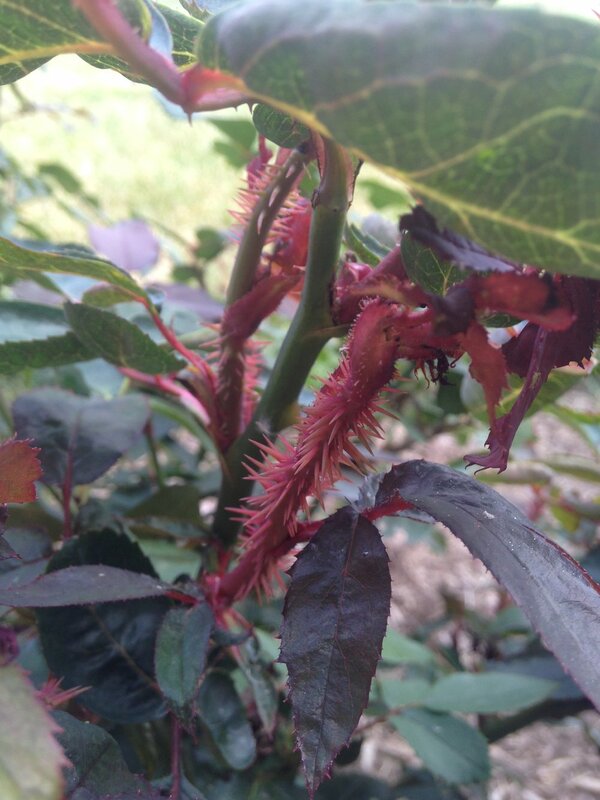 Stems become thicker and are totally covered in dozens of tiny thorns. Instead of new growth being leggy, it becomes very stunted, and you often see many stems spouting from the same spot. Sadly, there is no real cure for any plant viruses. With RRD, you can try to prune it out if you catch it early enough. Prune off any infected branches at least six inches below where you see symptoms. Roses are pretty forgiving when it comes to drastic pruning, so better safe than sorry here. Between each pruning cut, you need to sterilize your shears with 70% rubbing alcohol. Contaminated tools may spread the virus, so it's essential to clean between each cut in case you accidentally prune a spot that is infected. Sadly, pruning the disease out has not proven very reliable. To be really safe you need to remove the entire rose, including all roots. If the virus makes it into the roots, it can survive in the soil for many years and can infect the roots of nearby roses. To be extra safe, do not plant a new rose where you dug out an infected one. If you have a high value planting of roses you don't want to lose, it's best to skip the pruning step and dig out the entire rose once you notice it's infected. This minimizes the amount of time the virus has to get into the roots and then into other roses. The kind of healthy rose we want to see. Usually the best method for dealing with any plant disease is prevention. Unfortunately, prevention is proving difficult with RRD. The disease is spread by mites so tiny they can be carried on the wind. Once a plant is infected, it can be spread on contaminated tools before symptoms are even noticeable. There are no resistant varieties right now. A new variety with resistance may be released next year, according to the Missouri Botanical Garden. Keep your roses healthy. A healthy plant is better able to fight off pest and disease attacks. All new plants need consistent water in their first season, and roses can benefit from additional water in dry spells. Many roses are susceptible to leaf diseases in wet conditions, so watering the base is better than showering the whole plant from overhead. More information on good watering practices can be found here. In addition to watering, an annual application of a slow-release general fertilizer is never a bad idea. Always clean your tools. This is just a good sanitation practice in general for managing pest and disease problems in the garden. If you work on multiple properties, sterilize your pruners with rubbing alcohol between properties if you pruned roses at all, whether they are showing rose rosette symptoms at all. If you're just taking care of a home garden but have roses in more than one spot, sterilize your pruners when moving from one planting of roses to another. If you are digging up an infected rose, wash your shovel afterwards. Remove nearby multiflora roses. Multiflora rose is an invasive wild rose that is especially susceptible to RRD. Learn more about how to identify and remove it here. Remove all infected roses. We already said it earlier, but it bears saying again. Once a rose is infected, it's almost impossible to save it, and leaving it in will pose a threat to the rest of your roses. Apply a preventative miticide. Since a mite spreads the disease, a miticide can provide some level of protection. However, miticide only kills mites after they feed on the plant, so there is still a risk of exposure to the virus. I would use miticide for extra protection and to reduce exposure if I already spotted RRD on my property or one nearby, but it isn't a terribly cost-effective strategy for keeping the disease away to begin with. As always, it never hurts to contact a professional if you aren't sure what's going on with your plants. The Purdue Plant and Pest Diagnostic Lab (PPDL) is a great resource for learning more about plant problems and submitting samples for diagnosis. Here are 317Grow we are also available for in-person evaluation of landscape problems.